There's a front derailleur in there somewhere. I’m loving the warmer weather but…. ……where did the path go? I seem to be doing a lot of this lately. 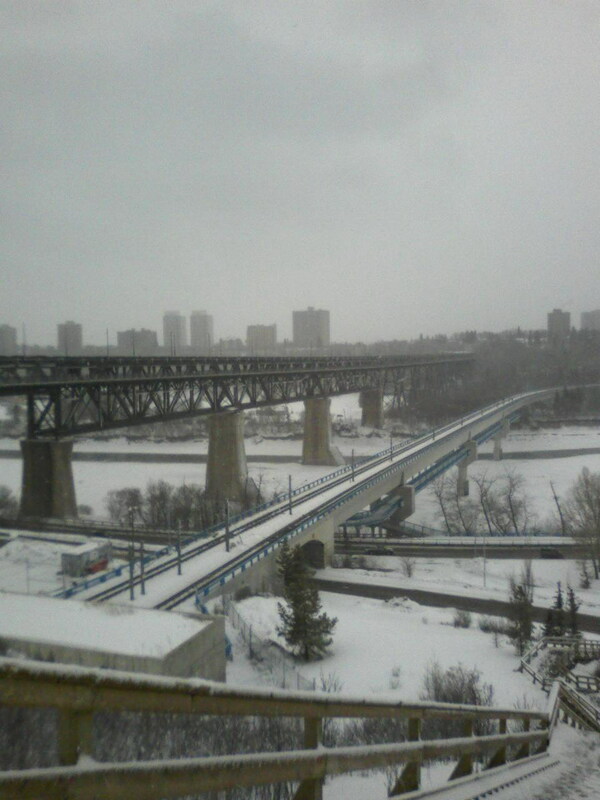 The snow is melting fast in Edmonton and leaving behind creeks and ponds of meltwater to cover the urban landscape. 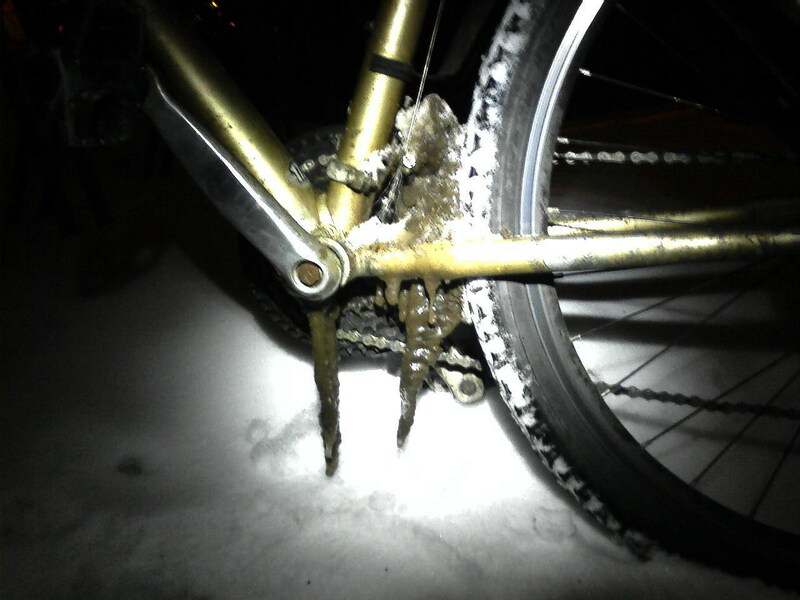 I’ve been riding through it for a few days now and this might be my least favourite part of cycling through the winter. A soggy commute home is followed by morning icefields after the temperature drops overnight. 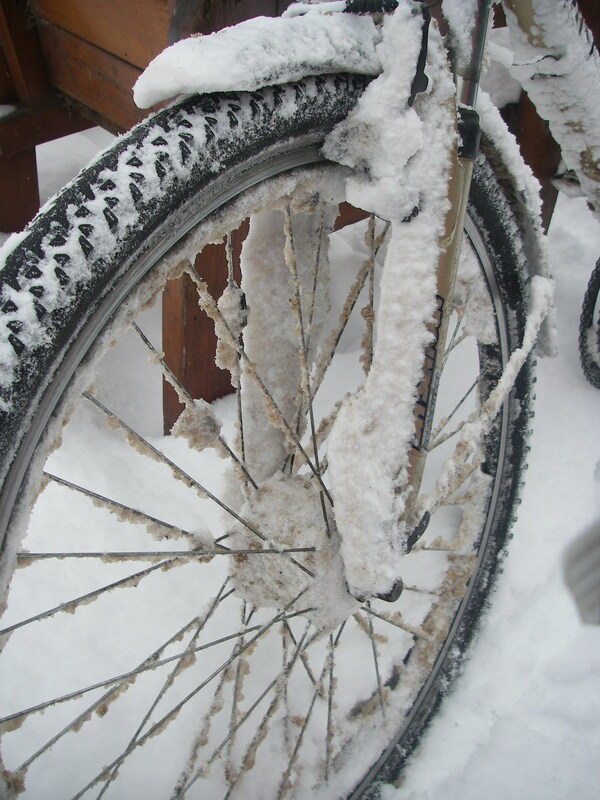 My powertrain has been freezing up each night and was so bad Saturday morning that I had to bring the bike into the house and thaw the chain with a hairdryer. I guess I’ll have to bring it into the house overnight for the next while. I was chatting with a fellow at the farmer’s market yesterday who was riding a Trek Soho with an internally geared hub and belt drive. That seems like a pretty good idea right about now. you ride the winter through. You seldom see the sun at all. You pedal in the dark. to be a real cheap skate. it doesn’t last a mile. no colder can you get. you’ll soon be soaked in sweat. and frostbite nips your nose. will leave no skin exposed. the ratchet sounds no clicks. and wish you’d ridden fixed. the snow falls axle deep. for lost low gears you weep. though greater weight you’ll lug. you’d roll on feeling smug. the Winter months are hard. Sand and salt are constant foes. Against them you must guard. good cheer does soon erode. the season takes its toll. to push it out takes three. one hand can lift it free. to quickly be packed down. of ice will then abound. and not fall to the street. you do not wish to meet. the hills are daunting slides. Now Winter fades and Spring returns. and thaw your frozen toes. and rip the roads on faster rides. But roads and paths seem duller trips. Less challenge now than then. 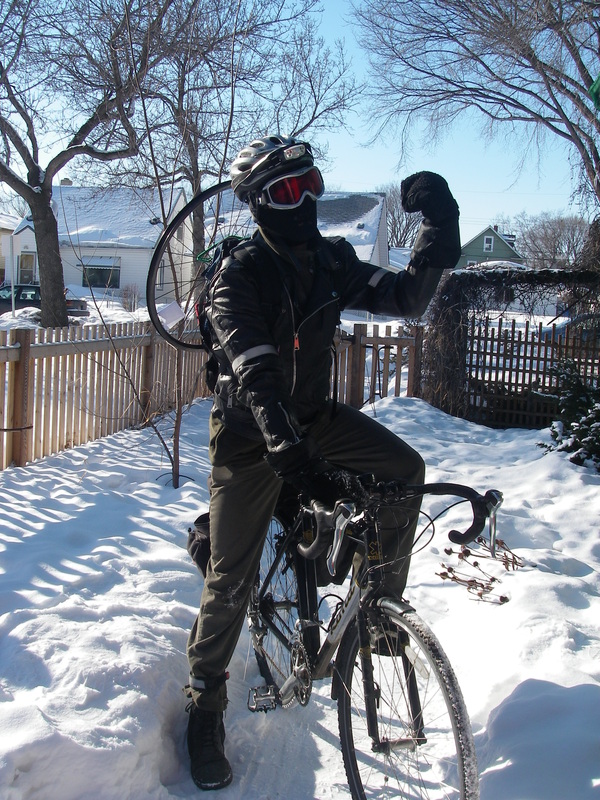 the Winter Cyclist rides again. 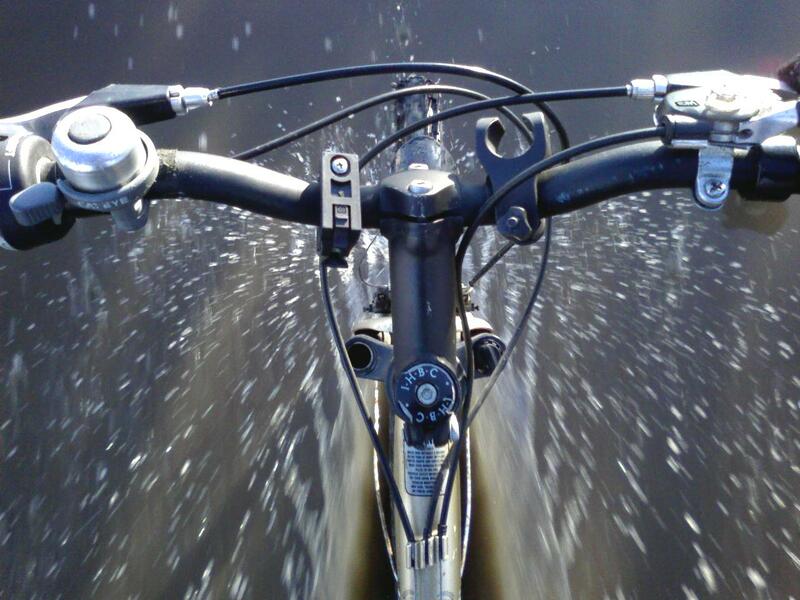 Icebike – The first website I found when I was considering winter riding. The folks at the Winter Cycling Forum for their collective winter wisdom. 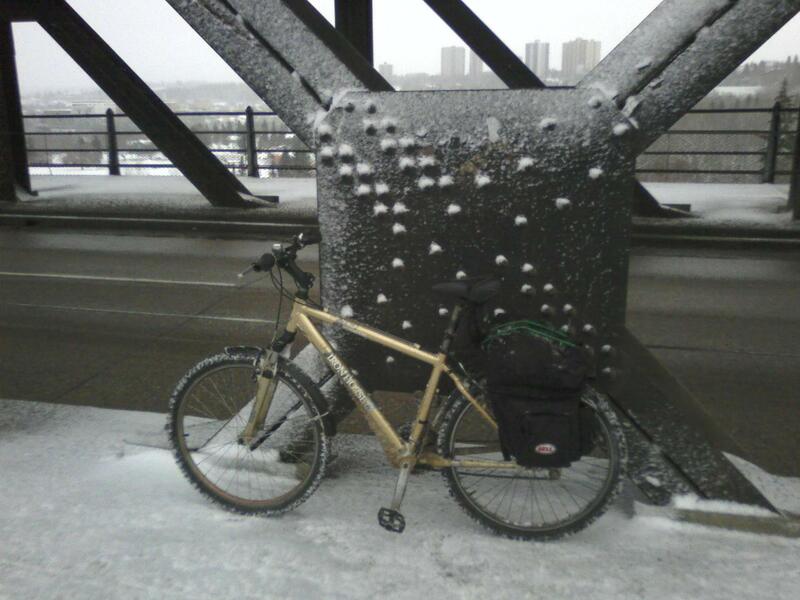 The good volunteers at The Edmonton Bike Commuters shop for helping me keep a winter bike on the road. After my underdressing yesterday I busted out and field tested my extreme coldweather gear today. 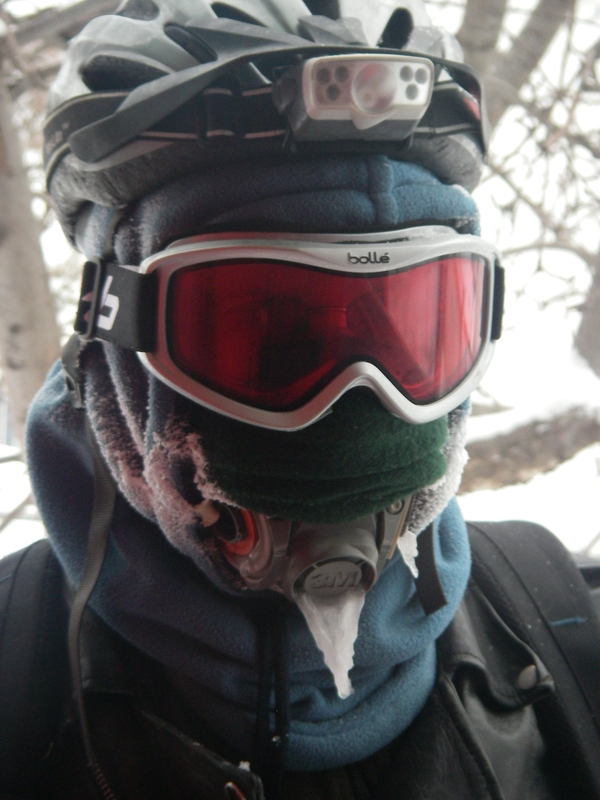 It was actually a bit warmer today (-26ºC) but there was a stiff wind.This was particularly noticable on the way home when I found myself cycling into a headwind that was resulting in a -34º Celsius windchill plus whatever I was generating by cycling. Today I felt like I was wearing a spacesuit: I was toasty warm. At the beginning of the season I picked up a pair of vintage ’80s ski pants (they are so VERY 80’s) at Value Village. I thought they would be helpful on the coldest days but I hadn’t used them yet as it turned out that even at -28ºC they were not necessary. After yesterdays brush with frostbite I put them to use today. I also dusted off an oversize set of boots that would fit three pairs of socks. Lastly I wore a 3M half-mask respirator with all filters removed. I had tried to use this earlier in the winter but couldn’t make it work. This time I figured out an arrangement of scarf, stocking cap and balaclava that seemed like it would work. On the way to work I was a little overheated. On the way home it was perfect. There was still a little problem with my glasses fogging up inside the ski-goggles but it cleared up part way through each ride. 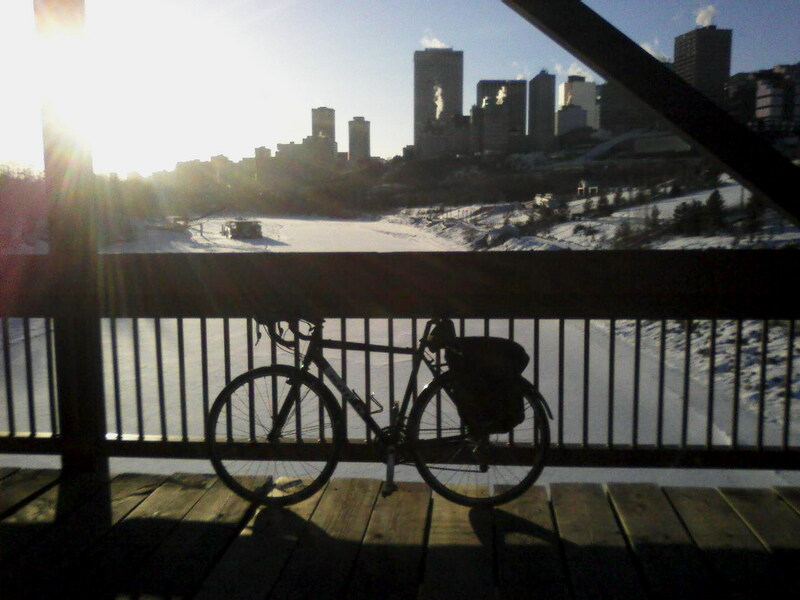 Overall, a success and I think this photo alone is worth having rode through the winter. Today felt like the coldest ride of the year even though I have already been out at this temperature a couple of times. Perhaps the fact that it is the first of March made -28° Celsius seem colder. In any case, I inadvertently combined my lighter weight base layer with a slightly lighter weight pair of pants and it made a real difference. My legs were so cold that halfway through the ride I stopped to activate a handwarmer and press it against my legs for a while. At the same time I tried to wipe the fog from my glasses only to find that it was actually a thick layer of ice. While trying to scrape it off I popped the lens out my glasses into the snow. When I decided to try riding through the winter this year I said I would stop if it wasn’t fun anymore. It came close this morning. 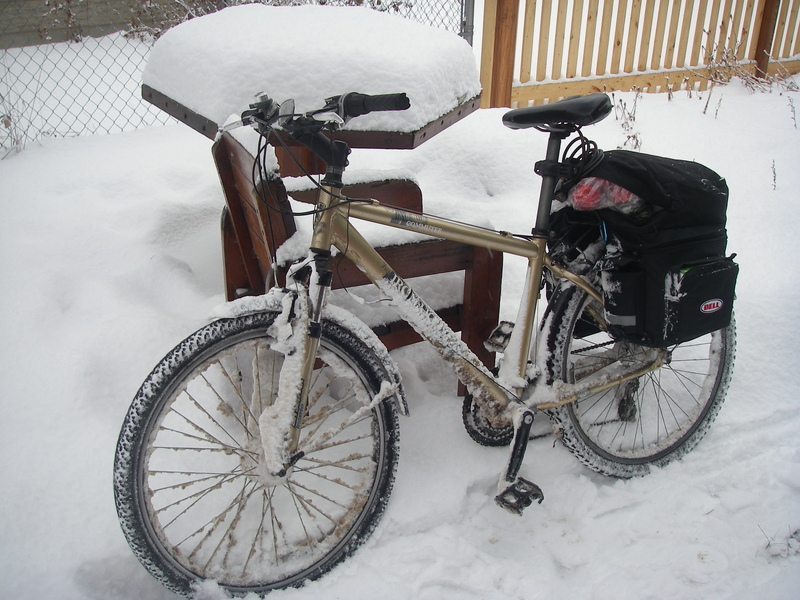 On the bright side, I finished repairing my winter bike today during lunch and was able to ride it home today.